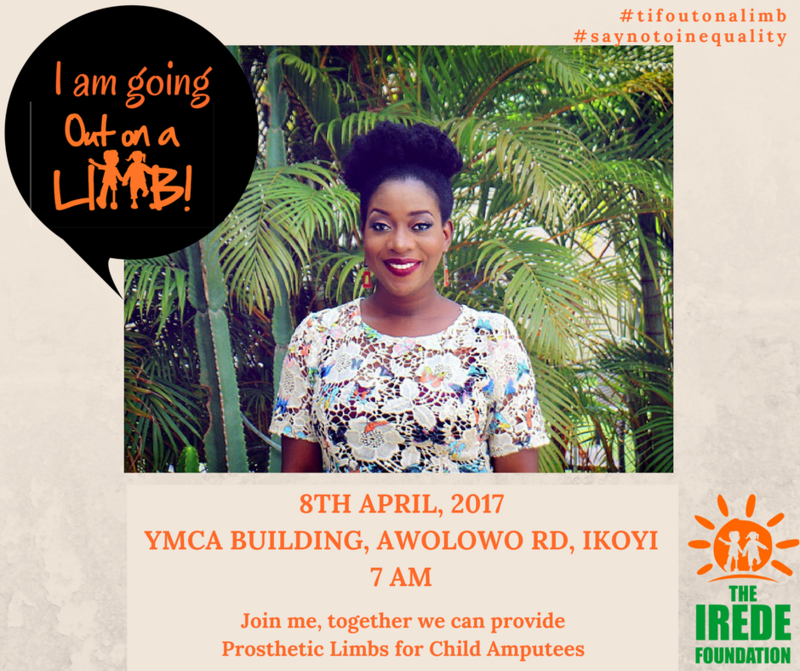 1000 Lead Advocates | 30 Limbs | 30 Locations as THE IREDE FOUNDATION goes ‘Out-on-a-Limb’ for Child Amputees. As part of activities to create awareness for children living with this condition the foundation has an annual walk tagged ‘Out on a Limb’, this year’s walk is focused on putting an end to Inequality, Discrimination and Stigmatization towards children living with congenital limb defect and limb loss. The 2km walk will take place in 2 different locations in Lagos and 28 other location spread across Nigeria and outside Nigeria. Members of the public are enjoined to participate by joining us at any of the below listed addresses within Lagos. T-shirts will also be available for anyone who wants to purchase at N4,000. Funds raised from t-shirt sales will be used to empower 30 child amputees. The IREDE Foundation will be empowering 30 child amputees within the year 2017. This is 150% increase compared to what we achieved last year (20 limbs were given in 2016). Providing 30 limbs can be made possible through donations and partnerships from well-meaning/philanthropic individuals, organizations and various governmental bodies. Nice initiative. How did it go?